After a year of anticipation, the remodeled Beanery Café, located inside the Benton Art Museum in the center of the University of Connecticut campus, will be opening its doors this Wednesday, April 15. With a new modern-tiled, subway look, more Torani syrups than can be found anywhere else on campus, space for musical performances, a unique selection of sandwiches and baked goods along with about 60 seats, UConn’s Dining Services Department has moved back into the building that housed their original dining hall in Storrs. “It’s neat to move back into the first place they actually fed people on this campus,” said Ethan Haggerty, the area manager of UC Cafes and UConn Dairy Bar. But the new Beanery will not be offering anything like what was once served in the original dining hall. Besides the variety of coffees and Italian sodas that made the old Beanery famous, the new café will be offering a wide selection of sandwiches and desserts. “We worked closely with our culinary team to develop sandwiches, we had a big tasting down in the commissary with a variety of people who had strong opinions about particular bread choices and spices and so on,” Haggerty said. The menu – which took about three months to develop, according to area assistant manager David Hille – includes specialties like the Sunflower Toasted Fig Flatbread and the Chipotle Short Rib Ciabatta. Dining Services’ Beanery will be continuing many of the traditions that began in the old café – such as happy hour. Between 2 p.m. and 3 p.m. each day all non-bottled beverages will be 25 percent off. Dining Services is also hoping to continue the mission of the Bean Team – a group of students dedicated to making social events a possibility at the Benton – by opening up more space and time for the students. Keeping the social atmosphere of the Beanery is something that is very important to the former and future employees of the café. The café will be open seven days a week: 7:30 a.m. to 9 p.m. Monday through Thursday, 9 a.m. to 4:30 p.m. on Friday and 10 a.m. – 5:30 p.m. on the weekends. Many students, especially those who worked at the former café, are more than ready to finally have their favorite spot on campus back. Gluten Free Bakery To Open! Dining Services at the University of Connecticut opens the kitchen of the first ever gluten-free bakery on a college/university campus this month with the goal of eventually supplying all residential dining units, cafes, catering and grab and go’s with gluten-free baked products by the end of the semester. The gluten-free bakery – located in Trumball House in the Towers residence hall area in the former test kitchen – will produce muffins, rice crispy treats, brownies, cookies, cakes and pies, replacing all the purchased items currently available at the gluten-free galleys in every UConn dining hall and at cafes. The biggest difference in gluten-free baking is the flour. Without wheat flours, bakers must use a blend of rice flours, potato starch and other grain meals. The new kitchen will be operated by a newly hired pastry chef who is herself gluten-free and is therefore well accustomed to the challenges of gluten-free baking and is educated in the field. The new UConn products have no preservatives and no after taste, as is often the case for commercial gluten-free desserts. “If you eat gluten and you can’t tell the difference than we know we’ve scored,” Landolphi said. Most other colleges and universities are just starting to develop gluten-free options in their main dining halls, let alone their bakeries, but UConn is lucky, according to Landolphi, and has a skilled and open minded staff that likes to stay ahead of the curve. Storrs, CT: On Thursday, March 26th, Chuck & Augie’s restaurant celebrated its 10th anniversary with a menu of customer favorites, gourmet cupcakes for all patrons, a trivia contest and soft jazz music for all to enjoy as they reminisced about the many meals shared at the favorite UConn gathering place. “They (lunch time patrons) were very excited because some of them have been coming for 10 years and they saw some of their favorites on the menu that they haven’t had in years,” Roselyn Lamont, the manager of Dining Services’ restaurant said. Lamont has been with Chuck & Augie’s since the beginning, helping to put the first shovel in outside the student union over 10 years ago. After 29 years with Dining Services as a chef, chef manager and now the manager of Chaugie’s, as students endearingly call it, Lamont was overjoyed to be celebrating all the hard work, accomplishments and memories of the department. “Looking at old recipes from the past was my favorite part of planning the event,” Lamont said. Many of these beloved recipes – including the Pistachio Chicken Salad and the Caribbean Salad – bring back not only memories of previous meals but the deep connection between Chuck & Augie’s and Spring Valley Student Farm. Many of the fruits and vegetables and even the flowers that decorate the venue come from UConn’s Spring Valley Student Farm throughout the fall, spring and summer. The new recipes that appear on Chuck & Augie’s menu are often inspired by new crops. Bringing back many old favorites wasn’t only nostalgic for Lamont and her customers, but also for several of the chefs who have been with the restaurant from its beginning. The celebration was scheduled for a Thursday – the busiest day for Chuck & Augie’s– in order to attract as many customers as possible. The lunch rush brought in many faculty and staff that resulted in a 30 minute wait. Lamont expected dinner to bring in mostly students and couldn’t wait to share in their excitement. With music, ice sculptures and character cut outs from last year’s winter favorite – Disney’s Frozen – and white, blue and sparkling decorations on all of the tables North Dining Hall was a completely different scene on Wednesday night. The Frozen Gala was one of the many specialty events that are hosted in the eight dining halls throughout the UConn Storrs campus each semester. Unlike the Mardi Gras Luncheon or Thanksgiving feasts that reoccur each year, North’s Frozen Gala was a one-time deal to highlight the currently popular film. “The menu was based on where the movie takes place, regional foods from Scandinavia,” North Dining Hall manager, Eric Janssen said. It included a blueberry soup, baked apples and a Swedish meatball dish. The out-of-the-ordinary food and festive atmosphere drew almost 1,000 students, about 20 percent more than normally make the trek to North. 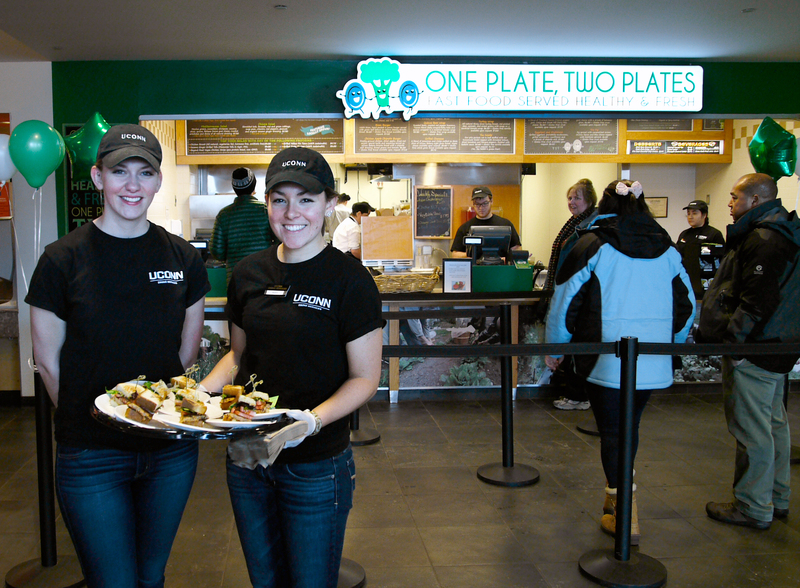 Storrs, CT: One Plate, Two Plate, a “fast food served healthy and fresh” restaurant operated by UConn Dining Services held an open house on Thursday, February 12, a few months after their opening at the beginning of the fall 2014 semester. Recognizing the need for a more expansive healthy choice menu, Dining Services spent the summer of 2014 developing menu items that included grain salads, vegetable wraps, and healthy tacos, to name just a few. The latest of dining services new venues replaced Wendy’s in the University of Connecticut Student Union. When Wendy’s announced that they would be shutting down their UConn location during the Spring Semester of 2014, dining services took the opportunity to follow the current industry trend. “One Plate, Two Plates was conceived with the philosophy that our menu options will be made from non-processed foods. We realize there are individuals on campus looking to strive for a healthy balance when it comes to food and more individuals are seeking out natural foods versus foods made with artificial ingredients. We hope that creating a menu based on preparing real food made daily from scratch will meet our community’s needs,” said Pierce. One Plate, Two Plate serves a variety of salads, wraps, burgers, and desserts made with all natural ingredients many of which, like the cheddar cheese, will come from local farms. “Personally, I like the idea of a new dining option in the student union. I spend a lot of time there during the semester, so I’d appreciate a wider variety of choices,” Jordan, a sophomore at UConn said. And variety is certainly what One Plate, Two Plates offers. The One Plate, Two Plate menu has been a culinary creativity adventure for the dining services staff. The menu includes choices like the Harvest Chop Salad – Tuscan blend greens (baby arugula/baby kale), roasted butternut squash, Macintosh apples, red grapes, toasted walnuts, Beltane Farms local goat cheese, and choice of organic dressing – and the Quinoa Beet Wrap – roasted beets, roasted red pepper hummus, Tuscan blend (baby kale-baby arugula) and quinoa wrapped in a sundried tomato wrap. “Everything was tempting, I just wanted to try it all,” Himakshi a sophomore at UConn, who was eating the Black Bean Rice Burger, said. And although Himakshi is a vegetarian she can actually try almost everything on the menu. “The goal is to make it whatever way they like it, whether that be vegan, gluten-free, or vegetarian,” Chuck Couture, the Assistant Director of Retail Operations for the University of Connecticut’s Dining Services said. In addition to working to make the options as vegan, vegetarian, and gluten-free friendly as possible Pierce and the other members of dining services did consider that One Plate, Two Plate replaced a Wendy’s. And the burger is certainly appreciated by many students. “I’ve been here a couple times and it’s always pretty good,” Jeff, a junior at UConn, said. “I usually get the bison burger,” although today Jeff was trying out the chipotle chicken burger free samples that were offered as part of the open house celebration. Although One Plate, Two Plates is not formally part of the meal plan several students have made a lunch or dinner trip to the restaurant part of their weekly routine. Storrs, CT: With eating locally and sustainably on everybody’s mind the University of Connecticut chose Michael Pollan’s 2007 book, The Omnivore’s Dilemma, which focuses on the modern politics and perils of today’s food system, as the UConn Reads book of the year. But encouraging students to simply read the book is not enough for many educators at the university. The event, entitled Just Food! Or is it?, focused on the environmental, nutritional and sociological impacts of the corn based food system in the United States that the first section of Pollan’s book discusses. This was the first fact tossed out at the students to impress upon them how much corn has come to mean to the United States. But this huge amount of corn is not the sweet, yellow ears that most people think of. This means energy for processed foods, for animal feeds, for ethanol, for export – leaving a very small amount for those summer barbecues. When the panel was opened up for discussion, the students in attendance – many of which were from environmentally conscious clubs like Eco Husky, EcoHouse, Real Slow Foods and Community Gardens – pushed the professors to give them ways that they as US citizens and UConn students can work to live more sustainably and encourage change in the nation’s food system. Although following the recent pushes to eat locally is very difficult in a state like Connecticut – where only about 2.5 – 3 percent of food sold consumed in the state is grown here as well – UConn Dining Services is striving to follow this advice by using the produce from the Spring Valley Student Farm as well as local apples throughout the Fall semester. Events focusing on parts 2 and 3 of Michael Pollan’s book are currently in the works for later this Spring semester to inspire further thought, discussion and action in the realm of food and sustainability in the UConn community. Storrs, CT: With red, white and blue tablecloths and many dishes loved by former United States presidents, the fourth ever ‘Pop-up’ dinner hosted by UConn Catering brought over 80 students together on President’s Day. Set up in the North Reading Room in the Wilbur Cross building, this was a feast quite out of the ordinary. The meal was served in a grazing party style with four stations – appetizers, entrees, soups and desserts. “Our soup station is being done in bread bowls for the first time tonight and kids seem to be liking it,” Wojtyna said. But it wasn’t just the bread bowls students were liking. Betel, like many of the 85 other students in attendance, found out about the event through a posting on the daily digest email that all UConn students receive. The element of guessing – or surprise – is certainly a crucial part of any Pop-up dinner. Nobody, except the catering staff, knows where the dinner is going to be until a few hours before, and they don’t find out the theme until they walk through the door. Pop-up dinners began about one and a half years ago at UConn when the Executive Director of Dining Services, Dennis Pierce, suggested it to Wojtyna. The planning for a UConn pop-up dinner begins about two months beforehand. The chefs must come up with an idea and plan a unique menu on a relatively low budget. But the hardest part, according to Wojtyna, is finding a location to host at such a bustling campus. Although Connecticut is still in the depths of winter, Wojtyna said he has already started looking forward to August and the start of a fall semester when the process will begin all over again. And he certainly isn’t the only one looking forward to it. “I would definitely want to sign up for the one in the fall semester,” UConn junior Sarah Butter said.